Lot:9446 Fr. 2405*. 1928 $100 Gold Certificate Star Note. PCGS Currency Extremely Fine 40 PPQ. Fr. 2405*. 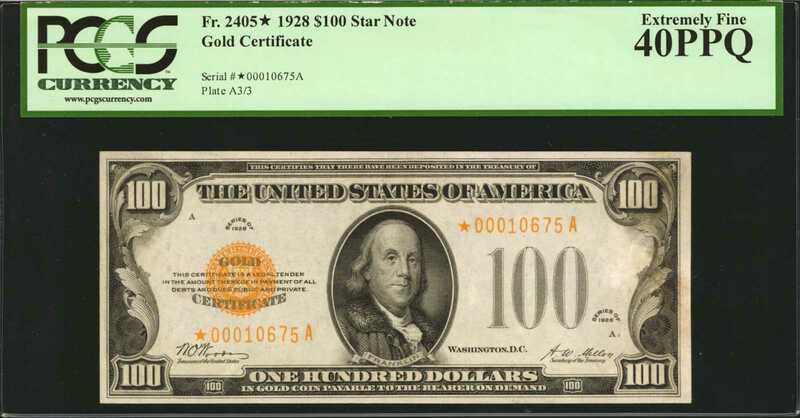 1928 $100 Gold Certificate Star Note. PCGS Currency Extremely Fine 40 PPQ.A historical offering of this incredibly rare replacement note which is the third finest known according to the PCGS population report. A quick look at both the PMG and PCGS reports shows that only a single piece has garnered a grade in the entire Uncirculated range with the finest from PCGS being an About New 50 note and PMG grading a single Choice Uncirculated 63 piece which sold for a staggering $223,000 in a 2017 auction. Just 13 examples are known in all grades combined according to Track & Price. This note shows with incredible initial appeal with deep gold overprints and a sharply inked impression of the beautiful $100 Franklin design. Seen with completely original paper surfaces and certainly a note which is absent in even the finest of collections. A highly important opportunity and worthy of a premium bid.